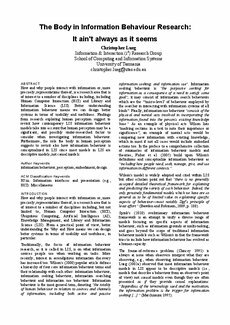 How and why people interact with information or, more precisely, representations thereof, is a research area that is of interest to a number of disciplines including, including Human Computer Interaction (HCI) and Library and Information Science (LIS). Better understanding information behaviour means we can design better systems in terms of usability and usefulness. Findings from research exploring human perception suggest to revisit how contemporary LIS information behaviour models take into account that human perception may be a significant, and possibly under-researched factor to consider when investigating information behaviour. Furthermore, the role the body in human perception suggests to revisit also how information behaviour is conceptualized in LIS since most models in LIS are descriptive models, not causal models.